Phoresy is a fascinating phenomenon in the animal world in which individuals of one species “hitch a ride” on another species. In contrast to parasitism, the hitchhiking animal does not take resources or feed upon the animal giving it a ride. Although examples of phoresy have been frequently described in the animal world, we still know little about its ecological importance for many species. A few years ago I was helping teach a lab in a graduate-level class at the University of Michigan’s E.S. George Reserve. 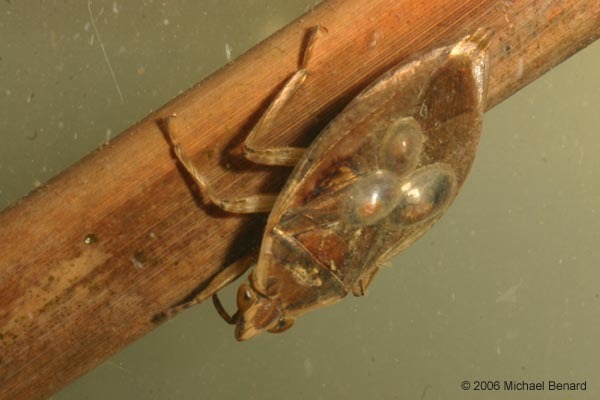 While sampling a large wetland, we found two water bugs (Belostoma flumineum) with strange bumps on their back. Upon closer inspection, we realized that the bumps were actually freshwater limpets (Laevapex fuscus)! These small snails are commonly found in ponds with water bugs. However, despite the fact that we’ve sampled these ponds for years, this is the first time we had noticed limpets on the water bugs. Our observation raised more questions than it answered. Was this an actual case of phoresy, in which the limpets were clinging to the water bugs so that they would be flown to another pond? Or was it just a chance event in which the snails clustered on the water bugs’ wings? If you’ve ever seen this phenomenon with freshwater limpets and waterbugs, I would be interested in hearing about it – please send me an email! Walther, A.C., M.F.Benard, L.P. Boris, N. Enstice, A. Lindauer-Thompson, and J. Wan. 2008. Attachment of the freshwater limpet Laevapex fuscus to the hemelytra of the water bug Belostoma flumineum. Journal of Freshwater Ecology 23:337-339. This entry was posted in Natural History and tagged Invertebrate, phoresy. Bookmark the permalink. 2 Responses to Phoresy, or just chance?